Enter a world of horror and mystery in Mansions of Madness Second Edition, a chilling adventure game in which you must fight to maintain your sanity and discover the truth behind the closed doors of Arkham. 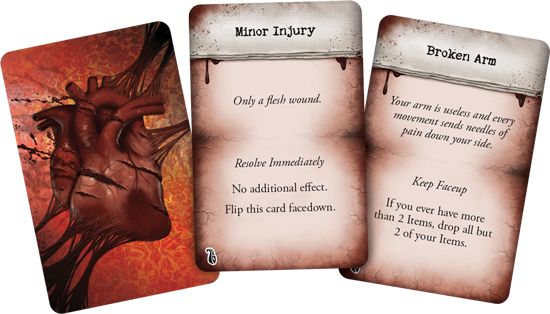 A gripping narrative awaits you in the upcoming edition of Mansions of Madness, with intriguing mysteries to be solved. Each scenario will immerse you in a tangled, arcane story, with a secret to be uncovered as you explore its unpredictable map, endure terrifying events, and confront savage monsters. Your search for the truth will be threatened by countless obstacles, including the limitations of your own body and mind, but with a careful combination of skills, abilities, and objects, you may just make it out with your sanity intact. At the beginning of your adventure, you will select an investigator with which to play through the game. The investigator you choose will have certain health and sanity values, a special ability, and a number of skills. 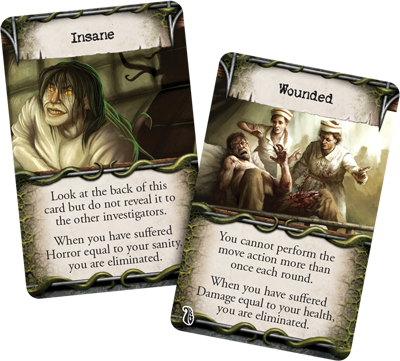 The values you need to pay careful attention to are health and sanity, which determine how much damage and horror you can handle before the forces of Arkham take their toll, causing insanity and wounds to varying degrees. Also important are your skills, which will play a significant part in how you move about the game, helping you avoid taking damage and horror in the first place. Skill checks will occur at many points throughout the game, whether you are attacking a fearsome monster, attempting to solve a complex puzzle, or simply gazing upon the mysterious painting on the wall. Whenever you perform a skill check, you will roll a number of dice equal to the value of that skill, and with enough successful results, you will be able to move forward in your investigation or attack. 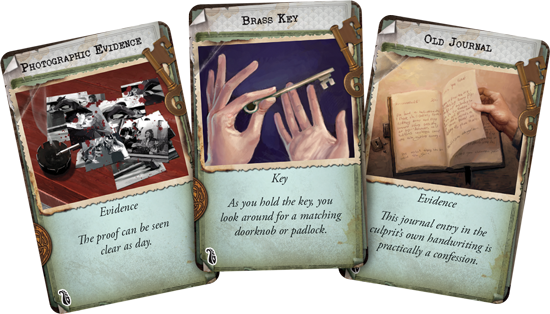 Besides the inherent traits your investigator possesses, you will also have opportunities to collect clue tokens, items, and spells, all of which may help you to successfully navigate the surprises waiting around every corner. You will find clue tokens in numerous places around the map, perhaps after opening a locked drawer containing useful items, interrogating the nervous butler for valuable clues, or reading through a cryptic journal entry in order to learn more about the hallowed halls you’ve been tasked to explore. On your skill rolls, clue tokens will enable you to convert investigation results into successful results, bettering your chance at success. However, your clues are limited, and deciding when you use them can be a challenging choice, indeed. Your investigators will begin the adventure with a small number of items and spells, but more may also be found and collected as you progress through the game. Items may vary from rugged weapons to useful trinkets, but each one provides you with a unique ability to assist you in your valiant efforts. Some effects act as constants, such as the Elder Sign Pendant, influencing your abilities for as long as you hold the item. These will enable any number of additional abilities, perhaps allowing you to roll an additional die, re-roll dice, or take extra steps while solving puzzles. Other items, such as the Holy Water, can only be used once, but often provide you with useful abilities, such as overcoming damage or horror effects and discarding cards. You may also come across scenario-specific items, such as keys, equipment, or allies. These cards will enable you to carry out very special effects, or help you get ever closer to your goal. A locked door is sure to have a complimentary key nearby, and any culprit of a crime is likely to leave behind evidence. You may even find bits and pieces of the puzzle you’re trying to solve, in which case you’ll have to find the rest, no matter how many bloodthirsty beasts stand in your way. The weapons and spells you find along the way will be especially useful in your fight to the finish, enabling you to perform more effective attacks, cast threatening curses, or assist your fellow investigators. A loaded pistol in the desk drawer or the recollection of a long-forgotten bravery-inducing enchantment may be the difference between maintaining your sanity or descending into the darkness of your own mind. Each tool you find will be a dim light in this dark world, blanketed in anguish and despair. Throughout your investigation, you will encounter many events and monsters, whether through your own curious wanderings or the unrelenting Mythos phase. Whenever you open a door or peer down a dark hallway, you may find yourself face to face with a vicious creature, poised and waiting to strike. The attacks may be more than just physical, however. With their supernatural abilities and grotesque forms, these monsters have the ability to terrorize you in body and mind, and only through skill checks will you have any chance to resist. When a monster goes in for a physical attack, you may be able to dodge their blow, as a keen eye for detail or well-trained agility will enhance your ability to avoid damage. If a Deep One takes a clumsy swing and you have an observation level of four, you will roll four dice. Each die you roll offers a chance to negate the damage that might be dealt to you, whether by rolling success, or by spending your clue tokens to modify investigation results. If you are unable to negate the skill check, you will suffer an amount of damage, which you will take in the form of damage cards. Some attacks may just graze you, having little to no lasting effect, while others will all but incapacitate you, challenging your physical strength. Horror is inflicted much in the same way as pain, testing your skills against the monsters' acute capacity to destroy your mind. If you are unable to stave off the panic with will or lore, you will collect horror cards, which will also affect you to varying degrees. A Minor Shock may cause your heart to skip a beat, but reassurance will quickly find you. However, a more lasting effect will leave you broken, unable to escape the darkness in your mind, and perhaps impact your later attempts to escape the unending terror. 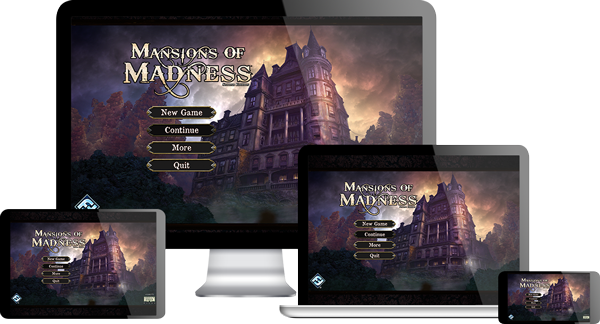 The many mysteries of Mansions of Madness Second Edition are still being uncovered, so stay tuned to learn more about all of the game’s captivating elements, from the app and its deeply immersive scenarios to the conversion kit and the endless possibilities it provides. On Thursday, we will dig into the app, including its impact on game set-up, puzzle-solving, and generating events. Then on Monday, come back to learn more about the included conversion kit, exactly how it brings the monsters and map tiles from your first edition game into the second edition, and the monster and investigator figures you will find in your game box. 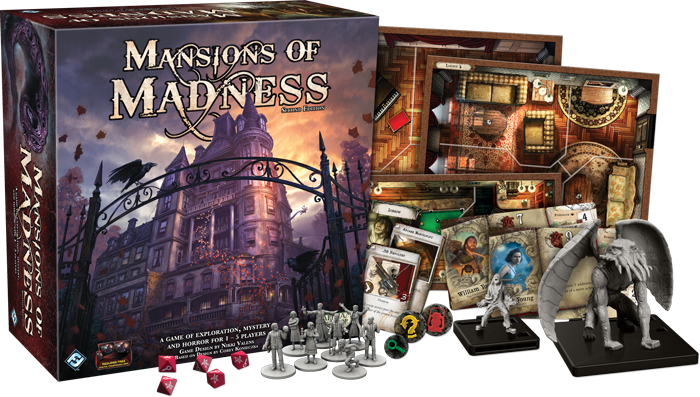 Mansions of Madness Second Edition will be available at your local retailer, online, and at GenCon Indy 2016 starting next Thursday, August 4.